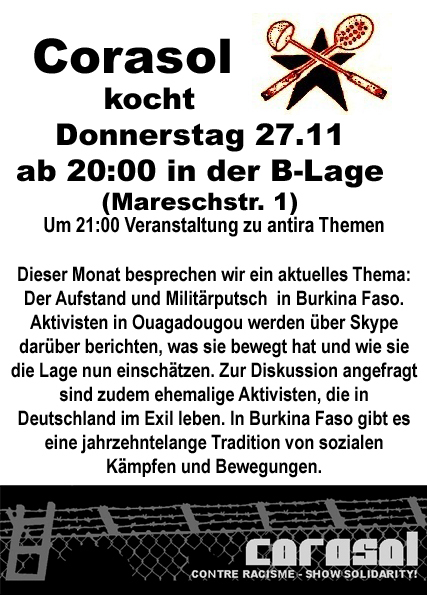 Neben Kuefa, Kicker & Co gibt es BRANDAKTUELLE INFOS zum AUFSTAND in Burkina Faso, mit Live-Schaltung zu Aktivist_innen in Ouagadougou, die am Aufstand mitgewirkt haben. Was ist zwischen dem 28.Oktober und dem 1. November in Burkina Faso passiert? Wie bewerten in verschieden Gruppen organisierte Menschen die Lage jetzt nach Militaerputsch und Machtuebergabe? Wie sah das Leben unter dem Regime Comparoé aus und welche Entwicklungen sind jetzt moeglich? Diese und alle eure Fragen koennen wir an die Aktivist_innen in Ouagadougou und an Marius Ouedraogo und Rasmata Sawadogo, Burkiner_innen im Exil, stellen. Avec le repas, baby-foot etc. nous avons preparé pour vous des INFORMATIONS TRES ACTUELS sur L‘INSURRECTION AU BURKINA FASO, avec une connection live sur skype avec des activistes á Ouagadougou qui ont participé dans les protestations de masse. Qu‘est-ce qui s‘est passé au Burkina Faso entre le 28 Octobre et le 1er Novembre? Comment est-ce que des gens organisés dans des diverses regroupements de base jugent la situation apres le coup des militaires et la transition civile? Quelle était la vie sous le régime Comparoé et lequels développements sont devenus possibles maintenant? Nous pourrons ensemble demander toutes cettes et toutes votres autres questions aux activistes de Ouagadougou et á Marius Ouedraogo et Rasmata Sawadogo, burkinabes en exile. Fine food is coming with BRAND NEW INFORMATION on the UPRISING in Burkina Faso, including a live skype connection with activists in Ouagadougou that were part of the mass protest. 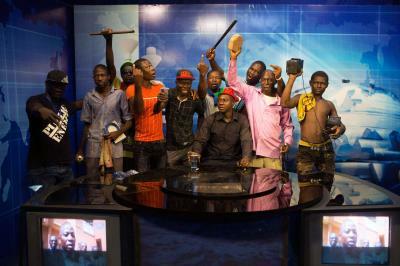 What happened in Burkina Faso between the 28th of October and the 1st of November? How do people orgaised in different groups see the situation now after the military take-over and the civilian transition? What was life like under the Comparoé regime and which developments are possible now? We‘ll have the occasion of asking all these questions and any other questions you may have to the activists in Ouagadougou and to Marius Ouedraogo and Rasmata Sawadogo, Burkinabes in exile that will be present. Corasol lädt ein zur Küfa! Mit Erdnußsoße, Reis und Teigbällchen. Thema diesmal: Der Aufstand und Militärputsch in Burkina Faso. Aktivisten in Ouagadougou werden über Skype darüber berrichten, was sie bewegt hat und wie sie die Lage nun einschätzen. Zur Diskussion kommen zudem ehemalige Aktivisten, die in Deutschland im Exil leben. In Burkina Faso gibt es eine jahrzehntelange Tradition von sozialen Kämpfen und Bewegungen. Corasol invites you to our next Küfa! With peanut butter sauce, beignets and rice! Topic: The uprising and military coup in Burkina Faso. Activists in Ouagadougou are going to report via skype about their motives the the revolt and their evaluation of the current situation. During the discussion there will also be former activists who live in Germany in exil. Burkina Faso has a long tradition of social struggles and movements. Antira Einkauf 14.11.braucht Unterstützung!!! +++ Antiracist shopping 14th November needs support!!! Wegen des GDL-Streiks wiederholen wir den Einkauf von letzter Woche. Kommt zum Einkauf und unterstützt unseren Kampf gegen das Gutscheinsystem! Es wäre gut, wenn ihr uns bis zum Donnerstag, den 13. November darüber Bescheid geben könntet für wieviel Geld ihr (ungefähr) einkaufen möchtet. Das Sammeln und Zurückhalten der Gutscheine wird für die Organisatoren im Heim Hennigsdorf dadurch erleichtert. Wenn ihr spontan für mehr Geld einkaufen wollt, ist das fast immer möglich. Treffen ist am S-Bahnhof Henningsdorf um 16:47 (da kommt die S25 an) auf dem Bahnsteig. Von dort gehen wir gemeinsam zum Supermarkt. Solltet ihr es nicht zum Treffpunkt um 16:48 schaffen, könnt ihr gerne zum Penny nachkommen. Wir sind mindestens eine Stunde lang da. Adresse: Berliner Str. 77a, 16761 Hennigsdorf. Genauere Infos zum Wie und Warum des Einkaufs findet ihr unter: http://corasol.blogsport.de/antirassistisches-einkaufen/. Due to the GDL-strike last week we are organising a repetition of the antiracist shopping for this Friday. You‘re invited for the next anti racist shopping on Friday, 14th of November. For the shopping we meet directly in Hennigsdorf at the station (S) at 16:47. If you can‘t make it at 16:47 to the station in Hennigsdorf you can also come directly to the Penny market: Berliner Str. 77a in 16761 Hennigsdorf. Antira Einkauf MORGEN braucht Unterstützung!!! +++ Antiracist TOMORROW shopping needs support!!! Achtung Bahnstreik. Infos unten. +++ Attention: strike of the trains. Information below. Für den Einkauf treffen wir uns direkt im S-Bahnhof Henningsdorf um 16:47 (da kommt die S25 an). Solltet ihr es nicht zum Treffpunkt schaffen, könnt ihr direkt zum Penny kommen: Berliner Str. 77a in 16761 Hennigsdorf. Ihr könnt euren ganz normalen Wochenendeinkauf tätigen. An der Kasse wartet dann jemand mit Gutscheinen in der Hand auf euch. Ihr könnt dann anstatt mit Bargeld an der Kasse zu bezahlen mit diesen Gutscheinen bezahlen. Im Anschluss an den Zahlungsvorgang gebt ihr dem Gutscheinbesitzer das Bargeld für den Einkauf. Friday, 07th of nov is the next antiracist shopping. With your support the refugees can regain some normality in their everyday life. As the political authorities have not yet realized and accepted that the voucher systems means racist discrimination (and actually additional bureaucracy as well), we still need your solidarity! Come to the shopping and support our fight against the voucher system! It would be great if you could register before coming by sending us a mail to antira.einkauf@web.de until thursday, with the approximate amount of money you want to go shopping for! This facilitates the collections of the vouchers for the organizer’s in the Heim. If you spontaneously want to spend more money, that’s usually always possible! For the shopping we meet either at Gesundbrunnen where we take the S25 together which leaves at 16:22 from platform 4 or directly in Hennigsdorf at the station (S) at 16:47 and walk together to the penny market and talk with those who participate for the first time about how it works. If you can‘t make it at 16:47 to the station in Hennigsdorf you can also come directly to the Penny market: Berliner Str. 77a in 16761 Hennigsdorf. Once a month we meet to go shopping together. You can do your normal weekend/ monthly shopping. At the supermarket checkout there will be a person waiting with vouchers who will pay for you with the vouchers. Afterwards you hand the person with the vouchers the same amount of money in cash. The main shopping takes place at Penny but it is also possible to go Kaisers. Please come to Penny first then we will go to Kaisers together. Notice: Alcohol, cigarettes and some other items can not be bought with vouchers. If you have questions just ask directly at the day of shopping. aufgrund des GDL-Streiks wird es eventuell fuer diejenigen unter euch, die planen, per S-Bahn oder Regionalbahn nach Hennigsdorf zum Antira-Einkauf zu fahren, eine lange Reise werden. Aus diesem Grund werden wir zusaetzlich zum Einkauf diese Woche einen weiteren am kommenden Freitag organisieren. Der Einkauf diesen Freitag findet statt, vor allem fuer diejenigen, die mit Autos kommen oder in der Naehe wohnen, oder auch diejenigen, die mit U-Bahn und Bussen fahren moechten. Zusaetzlich findet am Freitag, den 14.11. ein weiterer Gutscheintausch-Einkauf statt. Die Einladung werden wir wie gewohnt verschicken. Vielen Dank fuer Eure Unterstuetzung! because of the strike of the railway unionists the travel to Hennigsdorf might become a long one for those of you travelling by S-Bahn or train. This is why we will organise an additional antiracist shopping next Friday. So this Friday’s shopping will happen, mostly for those travelling by car or living close by, or the ones that are courageous enough to travel by underground or busses. Addionaly, there will be another shopping on Friday, the 14th of November. We will send the invitations as usually. For tomorrow you can go with U6 till Alt-Tegel and take the bus from there to hennigsdorf: http://www.s-bahn-berlin.de/aktuell/2014/pdf/141105_BNV_S25_%28Nord%29_Tegel-Hennigsdorf.pdf. Du browst gerade in den Corasol Weblog-Archiven nach dem Monat November 2014.